Forward: This article describes the firsthand experience of fighting Home Rule, and how TUA helps defeat Home Rule, the most insidious form of government in America. Lemont was one of five victories against home rule on November 6, 2018. The taxpayer advocate wishes to remain anonymous due to legitimate concern of governmental reprisal. Our home rule battle started innocuously enough a couple of months ago, after a meeting on another issue with the mayor and village manager. As we strolled toward our cars, the mayor casually remarked that truck traffic through Lemont’s downtown and elsewhere could be regulated if only we had home rule. I know only too well what home rule really means, and it’s not about restricting 18-wheelers. Five years ago Lemont residents fought the then-mayor’s plan to finance and build a boondoggle sports facility in Lemont’s downtown area by issuing Alternative Revenue bonds. I was part of a small group of about 10 concerned citizens – we dubbed ourselves LUV (Let Us Vote) Lemont – who packed Village Board meetings and challenged trustees and the mayor on the Alternative Revenue bond funding. While doing our research we learned that home rule had enabled Bridgeview, IL, to authorize a new soccer stadium without voter approval. The project did not pay for itself, as promised, and led to financial problems and at least 4 property tax increases. Lemont did NOT have home rule, so we were still able to demand a say. We collected the required number of voter signatures to force a backdoor referendum so we could vote up or down on the project. When the Village admitted that higher property taxes would back the bonds in case the project didn’t pay for itself, the pressure to “let us vote” increased. A few months later, the Village – perhaps realizing a referendum would fail – threw in the towel and yanked the plans for the sports facility. We didn’t get to vote, but we had won regardless. If the Village had been a home rule community we would have been powerless to stop the project. We used the information to send out emails to our friends and neighbors. Jim’s group sent us a flyer that made the case – and listed the top salaries and pensions in Lemont. TUA sent the flyer to its Lemont area mailing list, and created a Facebook ad. The local tea party, along with activists who had fought the sports facility, helped get the word out via emails and signs (most of which were stolen!). We also got some unexpected but much welcome assistance from Springfield–based REALTORS in Opposition to Home Rule. The REALTOR group mailed out 3 postcards to all registered voters in Lemont. 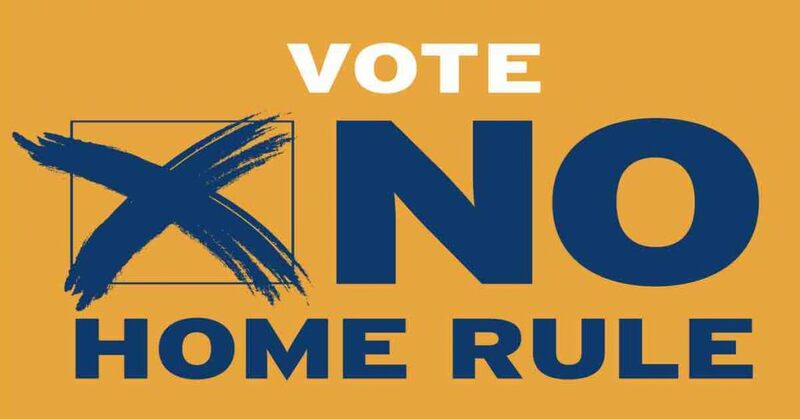 Each one hammered away at reasons to Vote No: More debt and higher taxes without voter approval, unlimited power in the hands of politicians, voters stripped of their power to say yea or nay, and onerous new fees, rules and regulations. Every argument was true because it’s exactly what has happened everywhere home rule is in force. We know what home rule did to Bridgeview. We reminded people how we were able to avoid a similar fate in Lemont because we do not have home rule. And we reiterated that home rule doesn’t begin to alleviate the crippling public pension obligations, high taxes and debt of other municipalities. Home rule is not the answer to the underlying problem of declining revenues and increasing pension costs. Harvey, IL, is the classic example of a town that home rule can’t save. It seems counterintuitive, but just because the truth is on your side doesn’t mean the fight is any easier. The Village marketing effort was run by a political action committee bankrolled by the mayor. Voters received a 4-page brochure from “Lemont Citizens for Road & Water Repairs,” AKA the mayor and his allies. The messaging was disingenuous from the start, framing a proposed 1% sales tax as a one-shot measure imposed largely on VISITORS instead of Lemont residents (as though Lemont residents don’t shop at home!). The Village said the tax would raise $1Million to address much-needed bridge and road repairs and water-related capital projects. The truth, of course, was that the declining revenues cited by the Village as justification stem from the same problem every Illinois municipality faces: The state’s out of control and unsustainable government-employee pension system. To sweeten the deal, the Village pledged to eliminate the residential vehicle stickers (thereby leaving available revenue on the table) and promised that the current Board would not use the newly granted power to raise property taxes or take on additional debt. The initial brochure was followed by 2 postcard mailings. “How do you want to fund Lemont’s $1 million,” a postcard asked. Listed under the NO column was a threatening list of what-ifs if the referendum failed, including a new referendum for a property tax limitation rate increase or increased debt, increased user fees, and significant and drastic staff reductions and reduced service levels. No mention that Village could, and likely would, push through all of the above with home rule. Or that home rule has not prevented staff and service reductions elsewhere. The postcard also dangled a nice “wish list” of projects that could be completed “with the additional funding from Home Rule,” including street repairs, 16 water main replacements, a new water storage facility and new deep well, engineering and improvements on the train tracks and a “train quiet zone” designation, a pedestrian/bike bridge over the Sanitary & Ship Canal, construction of a downtown parking lot, I&M Canal restoration and an ADA ramp, tree replacement, alley resurfacing an repair, sidewalk repair, and new traffic signals. Quite a list for $1million…and no mention of the underlying public pension burden that would likely consume most if not all of the new tax and lead to more debt and taxation to pay for the wish list! The Village made its final pitch in a postcard that promised to maintain police and public works services, provide for needed road and water repairs, and eliminate an increase in property taxes. All we’d have to do is give up our power to have our say and agree to higher taxes. Home rule failed by 995 votes out of total cast of 6,547. NO votes carried the day 57.6% to 42.40%. There were 445 undervotes…I am not sure why people chose not to vote on the issue. More voting data may tell us what areas the support for and against came from. 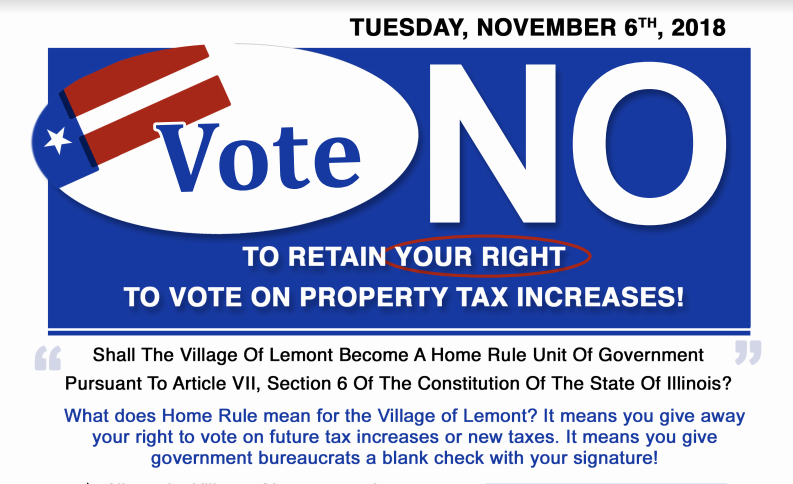 Lemont defeated home rule once before, in 1997. If the General Assembly does not lower the population threshold to automatically give Lemont home rule, I suspect they will not wait another 21 years to try it again. 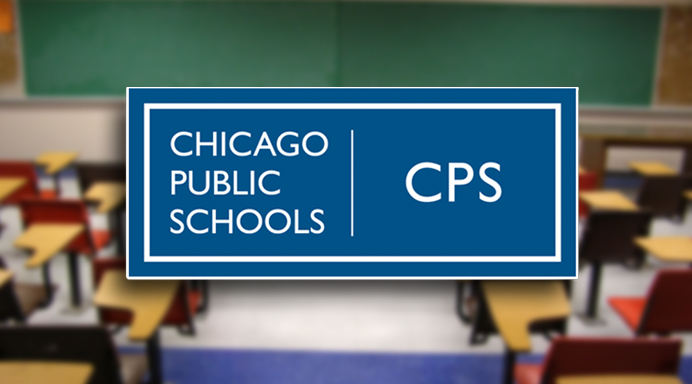 Chicago – Taxpayers United of America (TUA) has released the updated study of the Chicago Teachers’ Pension Fund (CTPF) conducted by its education arm, Taxpayer Education Foundation (TEF). “Chicago teachers are guaranteed a rich future that they consistently fail to provide for their students,” stated Jim Tobin, president and found of TUA. Last night was a series of mixed blessings for taxpayers. Yesterday taxpayers resoundingly turned down home rule from entering their communities. Beach Park, Lemont, Winthrop Harbor, Prospect Heights, and Zion all voted “No” on adopting Home Rule. By rejecting Home Rule, taxpayers have refused to give local politicians unlimited taxing power. However, the battle for the Illinois statewide government ended on a less rosy tone. J. B. Pritzker ran over incumbent Bruce Rauner for Illinois Governor in an unsurprising victory. Rauner, who refused to sign a Tax Accountability taxpayer protection pledge, ran an ugly Republican primary campaign against Jeanne Ives. Representative Ives had scored a perfect 100% while Rauner only scored a 92% in our TUA Tax Survey of the 99th Illinois General Assembly. Representative Ives had also signed a taxpayer protection pledge. Rauner’s attack on a committed taxpayer advocate combined with the tens of millions in funds for the Pritzker propaganda machine sealed the fate of the Republican governor. Now with a committed tax raiser back in the governor’s seat and a Democrat majority, it falls to taxpayers to resist the Income Tax Increase Amendment, a graduated income tax increase for middle class taxpayers.